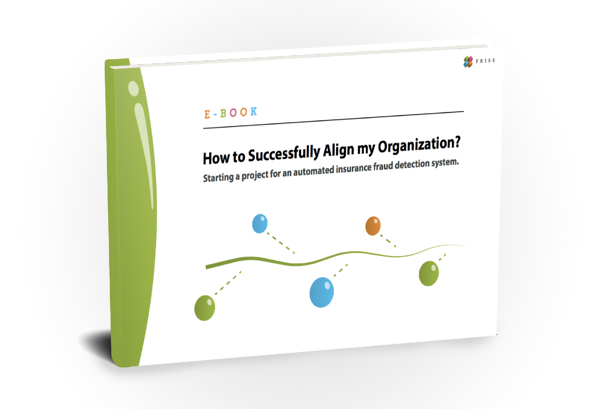 Ebook | How to Successfully Align my Organization? Starting a project for an automated insurance fraud detection system. This ebook is for insurance professionals that acknowledge fraud and high risks are a challenge for your organization. Now what? Use this ebook as a guide for your project. It provides you with an approach on why, how and when you can get the various stakeholders on board in order to make your anti-fraud project a success. A successful anti fraud project requires broad support from all involved stakeholders. Just having a system in place “for the sake of it” would not deliver the value that is demonstrated in your business case. The organization and the way processes are defined need to change as well. That can only be realized if there is a progressive and constructive foundation for the project.